A wonderfully round Sherry Scotia! Really good! A beautiful marmalade solo, without the bitterness of other 1st fills, I find it almost perfect as it is. The finish is just a tad too short as it lacks the 20-25 years or more, but then he would have been too bitter for me. Ok, first out of the bottle instead of glass. Immediately after removing the cork a smell like I've never had on whisky. Really musty old Chianti. Tobacco wooden box, slightly musty oak, plum juice diluted with water. In the glass he needs time, a lot of time. 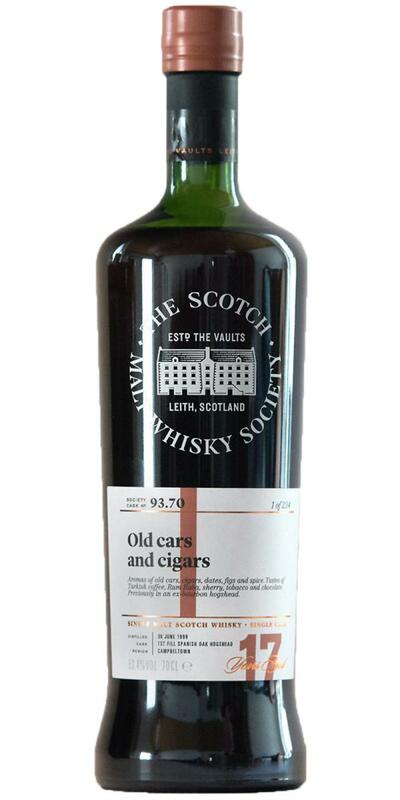 The power of the typical SMWS fillings is felt, it has to open. At first simply real wooden dresser, but mature and old, not with this young furniture polish. In the middle of dry autumn leaves lies the cigar box. After at least 10 minutes, it starts coffee beans, macadamia nut, raisins, motor oil, cinnamon, saffron, anise. Somewhere Creme de Cassis, but with 53.4% ​​instead of 20%. : ') After 15-20 minutes also the plum and date follow discreetly and old burned rubber tires. Wow, the 53.4% ​​are just right, you do not have the need to water, like some of SMWS's more powerful ones, zero. Crème de Cassis all over the place, plum syrup, blueberry jam, engine oil, dark Esther notes like in 25y black rums. And everywhere the sugar of the jam settles, as with the Benrinnes 21 Diageo that I mention in my profile, that's how I imagine Paxarette. Grape sugar, car tires, light dark tobacco, saffron, cardamom, caraway. Licorice and the old dresser of course in the background, dates to grated. An ingenious stuff. Surprisingly, something like apple peel or grapefruit, slightly acidic, but only light, which gives a nice counterpoint, probably. also sour cherries. Medium to long, rather the latter. But only very little bitter oak for the nose and the color, rather the remains of the grated fruit above. Cherry stones. A very nice Glen Scotia. Indeed like own your in garage. Nots like: smoking cigars, roasted coffee beans, dark chocolate, dates,figs and spices ; nutmeg,cinnamon , aniseed. Coffee like Turkish coffee, rich toffee sweetness, tobacco and some barbecue notes, steak, charcoal notes.Complex sweetness, also dried fruit, pudding, matchboxes. Middlelong, complex. lovely sweetness, marzipan, dark chocolate,plum jam. N: This is getting on for Rancio, certainly polished mahogany, furniture polish=shoe polish, sweet soy>bovril and vanilla-straw. Somewhat disappointingly, adding water brings the vanilla to the fore. T: Quite a complex and intense concoction with nutty notes [macadamia=cashew], a waxy mouthfeel and an acute yet sustained attack/intensity throughout - a style for the German’s i’ve been told, by Germans! F: Damn that vanilla, it’s everywhere now. Aside from that however, the polish and the deeper, [near rancio] sherry notes from the nose still apply. Lovely resinous waxiness on the mouthfeel at the end, modern and ‘techy’ yes but delicious all the same. No doubt in 30 years time we will be lamenting this mouthfeel style over the new contemporary style. C: I reckon this could pass for a cask strength 15yo Glendronach [Revival], and everyone would go mad for it - even with that over-done vanilla. 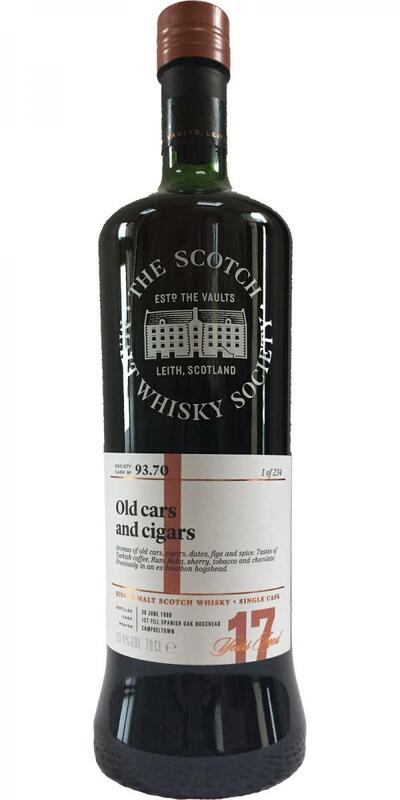 The nose suggests a garage for restoring old cars where the mechanic smokes cigars – we also got roasted coffee beans, pecan pie, dark chocolate, dates, figs and spices (nutmeg, cinnamon, aniseed). The palate had a slightly burnt rum Baba, Turkish coffee, rich toffee, sherry, tobacco and a steak seared over charcoal. The reduced nose – Tia Maria and Christmas pudding, dried fruit and matchboxes, while the palate gave amoretti biscuits and Anton Berg chocolates (marzipan, dark chocolate, plum jam) – one panellist remembered sucking on his pacifier. After 16 years in ex-bourbon wood, we transferred this to a first-fill Spanish oak oloroso hogshead. DRINKING TIP: While restoring old cars – or for dipping your pacifier.